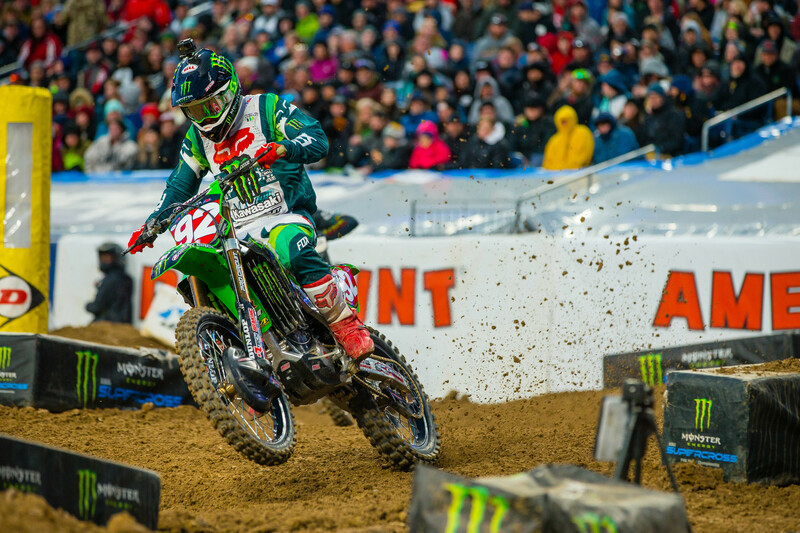 Can Eli Tomac win the title or is this over? Barring disaster, this is over. Tomac is my pick to win the final two rounds but the damage is done. He had too many “off” nights and gave away dozens of points along the way. With an 18-point cushion, Cooper Webb doesn’t have to take any chances at the final two rounds. Webb’s starts are keeping him out of trouble and he can basically let the races come to him now, picking his spots to be aggressive or back out of it. If he avoids trouble in East Rutherford, he will likely roll into Vegas with a 12-plus point lead (if not much more). Webb is your 2019 champ barring injury or DNF. Supercross hasn’t been to Denver since 1996, what did you think of the track? It was a wild weekend as far as the track goes. The Dirt Wurx guys did a great job of getting it covered before Wednesday’s blizzard. Had they dropped the ball on that, we would have had a very muddy track to deal with. Once they pulled the tarps, though, it was incredibly hard and slippery, even with snow on Saturday. Looking back to the race in 1996, it was the same hard, baked clay that Jeremy McGrath dominated on 23 years ago. The layout was very easy and was a hot topic all day. After Nashville’s very difficult whoop sections, it seemed that a message was received to lower the difficulty level in Denver and keep people on their motorcycles. I think we may have gone a bit too far in that direction, but I do understand the idea of preserving the superstars of the sport as we close out this series. The layout wasn’t my favorite, but I have seen worse. The rhythm sections were challenging and had the riders been at sea level, I think there would have been some big jump options executed. The one section I wish we could just completely eradicate is the 90-triple-90 combo that is typically employed when crossing the width of the stadium. This section is very common but doesn’t allow passing and the riders only use the inside line. I don’t see any upside to that particular combo other than the “oohs” and “ahhs” of the casual fan seeing a rider jump a triple. AC got it done, is the title his now? I certainly like his chances. Eight points isn’t a huge number but it will take a crash or mechanical issue to keep him from holding up the #1 plate. Adam has been great at Vegas, winning in 2017 and 2018, but those were also nights where the championship wasn’t at stake, either. I don’t know if he will push the limit and win again in Vegas but I think he can easily follow Dylan Ferrandis around if needed. As long as he can mark Ferrandis and manage the situation, it shouldn’t be that difficult to bring this thing home. Michael Mosiman looked aggressive. What did you see? He has been building toward this for a month or so, improving week after week. He was fighting for his position which he should absolutely be doing. He didn’t do anything dirty and didn’t put the title fight in jeopardy per se. I could understand if Cianciarulo was frustrated with the battle but, hey, this is a supercross win we are talking about. As long as there isn’t hard contact, it’s all fair game out there. Mosiman’s job isn’t to worry about someone else’s championship aspirations. I think there was a directive to lower the level of difficulty after a tough Nashville round. There were several crashes in both of Nashville’s whoop sections, one involving the points leader Austin Forkner. Losing stars of the sport is a big no-no if at all avoidable. I am okay with an easy set of whoops every now and again. Variety is the spice of life. Just don’t turn easy whoops into the mandate. Supercross is supposed to be hard. Marvin Musquin struggled late. What did you see? He just didn’t look like he had his A game all night. He struggled in the heat race, making mistakes and losing time. He grabbed the holeshot and on most nights, I think he would have disappeared with a victory. I don’t know if it was the icy conditions or he just had a bad night, but he certainly didn’t have “it” in Denver. With Joey Savatgy and Justin Bogle running interference behind him early, he had every opportunity to scamper away from Tomac and Webb, but didn’t have the pace this time. Bogle has been good lately. What’s making the difference? A big part of it has just been time. He came into the season wildly unprepared. He hadn’t tested the new KTM, he hadn’t really ridden much of anything to be honest. The last 18 months have been one injury after another. That eliminates any momentum or fitness base, which leads to lackluster results which plagued him all summer. He has had a few solid months of building, steadily improving his fitness, confidence, and sorting out a bike mid-season. Good results are often not due to one specific variable, but a culmination of many. Savatgy finished in the top five with a shoulder injury. How did he pull that off? Going into the night’s racing, he wasn’t even sure if he would suit up. The biggest factor in this going well was the start. He grabbed a great start and put himself into the right situation. Once the adrenaline starts pumping and he’s running inside the top three, that pain fades. Had he started 15th, I think it would have been much easier to cruise around or pull off if things didn’t feel great. Adrenaline is a powerful thing. Ken Roczen struggled again after showing great form in Nashville. Why? Kenny has been vocal about ongoing issues that they may or may not have their finger on. Whatever the issue, he is suffering late in the races and is unpredictable as to whether he will have elite level pace we know he is capable of. On nights like last Saturday, he just looks “flat.” He doesn’t have any pep in his riding and seems to be going through the motions more than anything else. Luckily for Kenny, even being “flat” is good enough to battle for a top five, but it’s nowhere near the level he can achieve. Hopefully they can figure out what’s wrong before we get to Hangtown because it will only get worse as conditions get tougher.